The article examines aspects of physical education in the Bulgarian school system from the end of 19th century till the eve of the Balkan wars and WWI. The official prescriptions to the school discipline, its institutional practices, and the strategies for their justification presented in the public discourse, are subject of historical reconstruction. As far as school had a place of priority in the state institutional policy, the educational ministry underlined the significant role of school gymnastics in fighting “degeneration” of the youth – the “future of the People”. The reception of certain clichés of the European discourses on “degeneration”, regarded as a continual regressive deviation of the human from an ideal type, provided a mechanism for description of cultural phenomena through organic coding. The imagery of “degeneration” was inscribed in the general concept of physical education as upbringing of body through double-code rhetoric of physical health as “the core of moral health”. The text argues that the school syllabuses defining the goals of gymnastics constructed a peculiar hierarchy of values in the ethics of body, namely “moral health – civil virtues – national wealth”, where the nation itself was presumed as the supreme good. Thus the strengthening of the school youth’s body was projected in the framework of a national identity project. In the period under review “fighting degeneration” through school had stronger rhetorical than disciplinary effects. This can be explained with the deficit of cadres and finances, and with the fact that the notions of “degeneration” functioned more or less as fashionable “loanwords” and not as deeply reflected imports from the lexicons of the contemporary bio-medical jargons in Europe. However, a tendency for “adjusting” body health models to images of social and national “health” can be detected, as well as the rise of a “bio-pedagogical” imagination as a bio-political one. This article is dealing with the manifestations of “age” in the life of the Bulgarians in the end of the 18th and the very beginning of the 19th century. “Age” is displayed as having different meanings in different parts of human‘s life, in different “ages”. On the other hand, “age” is represented as having different functions and structuring differently different ways of life. The last, but not least – “age” is used as a methodological frame of reference for analyzing the state of human society, overcoming the most commonly used for this purpose concepts of “modern” and “traditional”. The article examines nostalgia and the attempts for reconstruction of the past, stated in Bulgarian National Revival 19th century texts. The overestimation of the free Bulgarian past is inspired by the realization of its potentiality to legitimatize national identity. Its attractive force, its obligation towards the unforgettable precursors and the authority of the cultural heritage shape the portrait of a significant National Revival’s subject designated in the present text by the notion of “mnemonic”. The essence of this subject is its “retentiveness”. He “remembers” mythical prehistoric events from the sacred times of the Bulgarian Golden Age which are compared with the chaotic immediate experience, with the times of unfree Bulgarian living. The purpose of its commemorative strategies is to fill the gaps in the historic tale, to oppose the cultural amnesia, to transform the knowledge of the past into a motive power of its future development. The figure of the mnemonic subject is represented fully in the poetry of Georgi Rakovski, Petko Slaveykov, Dobri Chintulov, Nayden Gerov and others. The article reviews the problem about the folklore elements in Hadjiiski’s work and aims at interpreting them with ethno-sociological apparatus. The object of the empirical study – Hadjiiski – has often been used as an object by other research interests but he has never been analyzed through the folklore perspective and with the methods of ethno-sociology. The attention is paid to specific texts proposing us significant contribution to folklore elements and the method used by the author. The essence of the research is a practical work on the interpretation of separate folklore texts by Hadjiiski, using ethno-sociological methods. The abstract theoretical model includes problems of body, biography, normalization (Bourdieu, Foucault, Nikolova). They are performed in practice (using folklore examples from Hadjiiski) and the efficiency of the chosen methods is proved. There is one possible methodological scheme offered by ethno-sociology that works at the both levels of analytical work (text and metatext). The text represents a first attempt at comparing a concrete social phenomenon, the Knighthood, with the highest cultural manifestation of his own self-sensation – the written records of the courtesy. Without having any claims on exhaustiveness, the text aims to grasp the characteristic for the medieval knight as a force, which forms the appearance of certain social relations, and also as an object of a literary idealization. Therefore we discuss at the same time the meanings, which are assigned to the images of the knight, the fortress and the tournament, and which are contained in several selected, representative sources and records. Through these two – the fortress and the tournament – the knight can be adequately defined as a social figure. By virtue of that, we could distinguish the single motives within the courtesy literature: imaginative, sensual, religiously disciplining, social ennobling, authentically martial etc. Furthermore we obtain some notion of a concrete condition, with which comes into collision as a problem the culturally dominating idea with an ecclesiological origin of the three ordines in the medieval societas. The paper represents a part of historical and philosophical examination of the problem of the actualization of the border as a cultural appearance, on the one hand, and as a specific philosophical conception in the Middle Ages, on the other hand, which can give us the specific philosophical content of the concept of the borderdom as a dynamic realization of the border, as far as the medieval epoch affords us the opportunity to observe the finest and widest philosophical comprehension and the deepest existential manifestation of the borderdom. In order to demonstrate our thesis, we examine the basic cultural manifestations of the borderdom, like the symbolism, the Church and the paradox, and the essential philosophical conceptions, especially that of Anselm of Canterbury, of the possibility of rational knowing of the transcendental principle, which conceptions give us the concrete appearance of the medieval philosophical concept of the borderdom. The text contains also an important interact, which presents a link to the specific Byzantine energetic comprehension of the borderdom, by examining the philosophical view of the Church, the Eucharist and the perichoresis. The paper deals with the different names that are said to be in use for modern Plovdiv in the time span between IV c. BC till A. D. IV., i.e. Eumolpias, Poneropolis, Philippopolis, Odrussa, Tiberias, Trimontium. Since most of the theories proposed in the bibliography are based on the ancient written sources, a critical analysis is made of all of them known up to now and the hypotheses advanced so far on the emergence and usage of different names are critically revised. For instance, since the concrete use of the name of Eumolpias is not yet proved, its appearance in late sources could be due to the propaganda which is attested in Thrace that time when the biggest cities tried to link their origin from different personages of the mythology. Of special interest is the setting of the date when the name of Philippopolis started to be in use. It appears for the fi rst time in Polybius’ book where, however, the history of Macedonian kingdom was during its last kings – Philipp V and Perseus. The lack of a note that Philippopolis was actually after Philipp II makes one believe that the city was named after Philipp V who in c. 182 B. C. seized and took over the fortress here and founded a garrison. It was during that time when we have the first inscriptions mentioning the local magistrates. It should be emphasized that the connection between Philippopolis and Philipp II is mentioned for the fi rst time in II A. D. which might be regarded as a result of the royal Macedonian and local propaganda which characterises Thrace and Greek Orient at that time. During the Roman period two new names were introduced – Tiberias and Trimontium. The first one was probably the result of the recognising of the Thracian ruler – Rhoemetalces II as basileus by the Roman princepss Tiberius, while Trimontium was the official Roman name which was found informula provinciae. Taking as a stating point Weber’s thesis of Modernity as “disenchantment of the world” – a specific organisation of the social order, subjected to calculation, rationality and formal rules, which bases the state legitimacy on impersonal, normative rules – the text aims at outlining the particularities of the socialist Modernity. It focuses on the legitimating mechanisms of Bulgarian political authorities, which produce specific, socialist strategies of everyday conduct, socialist ethos and modes of production and consumption. The main argument of this article is that in a situation of total lack of leisure time the social agents can express their personal interests and stakes only by subverting the officially constructed temporality of excessive working efforts and appropriating parts of it for themselves. The major question is whether this “stolen” time represents a kind of alternative to the official rhythm of socialist living or the state apparatus has secretly presupposed it. The text tries to find an answer by studying the techniques applied in “stealing” time and the purposes this “quasi-free” time is used for. The basis for the analysis are the archival materials of 114th secondary school in Sofia (also known as Sofia English Language School). The conclusion made after interpreting the empirical corpus is that the various practices of stealing time that disrupt the officially prescribed students’ ethos are foreseen and accepted with acquiescence by the political and school authorities. They are not an alternative but an integral part of socialist inconsistency. Sixteen years after the fall of the communist regime in Bulgaria, there is yet no national policy on the memory and heritage of the regime in operation. The public discourse on communism and its legacies seems only now to be coming out of the deadlock it had been trapped into for more than a decade. The main thesis of this article is that in terms of mastering the communist past, with all the reservations the term entails, Bulgaria is considerably lagging behind its fellow former Soviet Block countries, most of which have already established specific national agencies dealing with the issues of national memory, museums of the history of communism, and national memorials dedicated to the victims of the regime. The article looks into the possible interpretations of the long protracted deadlock in the debate on the politics of memory in Bulgaria, placed in a comparative European perspective. The research focus of my attention is turned particularly towards a number of projects from the recent years that make an explicit attempt to face the ghosts of the communist past that have haunted the society all the way through the years of transition. The article focuses on the interlocking relations between democratization processes and phenomena of nationalism after the end of the Cold War. The question is whether democratization processes are impeded by nationalism or nationalism is of importance for the democratization of a political community. Answers are sought through mapping the areas of compatibility and incompatibility in the nationalism-democratization relationship in both normative-theoretical and empirical plans. The exploration shows that the nature of the relationship is complex and ambiguous which rules out any straightforward conclusions. The revealed multiple and diverse causal interdependencies within the nationalism-democratization relationship indicate at the complex dynamics and temporal transformations in the relations between processes of democratization and appearances of nationalism in post-communist transition. The paper investigates the transformation which is taking place in the Bulgarian urban landscape during the last 20 years. The research interest is concentrated on the migration and stabilization of a former informal market-place in Sofia as an example of the phenomenon. That process is seen as a result of a deep change in the role of the citizen and of the formation of new politico-economic elites. Being itself a liminal phenomenon, the marketplace engenders a set of myths about its origins, organization and material culture. Those myths make visible a rupture in the experience of the past. We argue that there is a symbolic displacement of the marketplace within its physical one. So, it is simultaneously legalized and hidden in the city periphery. The paper analyzes the functioning of the architectural services market during the postsocialist period. This market of professional services is revealed as formed by three types of relationships that are interdependent: relationships between clients (former and potential) who discuss among themselves the services offered by professionals; relationships between architects who discuss the quality of their work and create professional “norms” according to which the market is oriented; and relationships between architects and clients who negotiate the quality of projects, their price and terms. The paper argues that the professional services market has been created jointly by these three types of relationships: neither architects, nor clients can determine separately the mode according to which the market functions. In order to analyze the functioning of the professional services market, the author refers to the concept of “economy of the quality” originally developed by the French sociologist L. Karpik (1989, 1995) who analyzes the market of the attorney’s services in France. The author emphasizes the strong characteristics of that concept, as well as its limitations. While studying the case of the architectural services market in the post-socialist context, the author further develops the concept of “economy of the quality”. The article analyzes the problem which has never been studied in Bulgaria: the functioning of the architects’ professional services market. The text explores the cultural and historical situation, still marginally reflected, of contemporary visual arts in Bulgaria. It takes as its springboard the chaotic terminological field of the language used to discuss contemporary art, seeking solid grounds for an analysis of the problems of identity and lack of institutional support for contemporary art. Unlike other countries of the former Eastern Bloc, Bulgaria had no alternative structures to oppose the regime. The change in art discourse and representation following 1989 came from “within”, from the structure itself. This, in turn, is the cause for the antinomical way in which contemporary art becomes integrated and alters the inherited aesthetic views and perceptions. The text examines the possibilities and non-possibilities for the formation of contemporary art context in the situation outlined through analysis of the specificities of art’s subject position before and after the fall of communism. These problems are reviewed through an emphasis on the reconstructed debate over the “avant-garde” of the early 1990s. The extremely popular since the middle of the 20th century, fantasy-genre that creates an alternative universe is examined here in relation with utopia – the other genre of the alternative. The main article thesis is that utopia has not disappeared from contemporary world but only is transformed in a way that makes it diffi cult to be recognised. In this context, utopia is analysed not in its fi nal result perspective – a model of universal happiness, which is organised around the problem of social justice and progress. The post-modern utopia is a dynamic one and deals more with happiness – the aim that single person and the society as a whole make it to. But happiness is not rooted in equality, nor is it related to progress – both, social and technological one. The fantasy-genre is seen here as a utopia of the road, personal realisation, responsibility toward the others, and in the end, as a balance, which is the sole firm foundation on which it appears that happiness could be based – both the individual and the common one. The proposed article is an attempt to conceptualize the notion of social artefacts or ‘social kinds’, using the theoretical framework of Davidson, Rorty, Putnam, in which the dualism of scheme and content, of conceptual and empirical is ruled out. In the first part, I maintain that one radicalised notion of refl exivity in the field of social sciences could be treated as a peculiar counterpart of the repudiation of these dualisms. This is a way of bridging the gap between the objective social realm and the numerous ways in which we conceptualise it, describe it, provide common accounts of it, etc. In such a sense the existence of social artefacts or objects is considered, using the notion of conceptual scheme, that is the idea that objects do not exist independently of conceptual schemes or that objects and reference arise out of discourse rather than being prior to discourse. Ethnomethodology provides ground for analysing the jointly and locally achieved, maintained and shared use, which is in fact the core of the conceptual scheme itself. Roughly, this is the content of the second part. The third one conceptualises the existence of social artefacts as such objects arising out of shared use or ‘intentional objects’ (Rorty 1991). Finally, as a conclusion, I contend that, on such basis, the distinction between conceptual scheme and collective intentionality could be discarded: in fact these notions refer to the same entity. This is one necessary supplement to the theories of collective intentionality, which are rooted exclusively in the theories of social action. This article aims at clarifying the relationship between social science and everyday life as two aspects of one form of life, which interpenetrate and complement one another. The treatment of this relationship in the works of Alfred Schutz is considered as a departing point. The article examines the systems of relevance which organize the social experience and argues that they represent an important dimension of the interpenetration of the relationship between social science and everyday life. Tracing the genesis of the systems of relevance back to the social practices, which form them, the article questions Schutz’s statement that the action and the communication are possible only in the paramount reality of everyday life. Therefore it argues that the world of science can be characterized by a specific form of everyday life and that an empirical study of the types of rationality of scientific and everyday actions could clarify the interaction and interpenetration between them. This article poses the commonly neglected problem of the origins of contemporary mathematical logic. The cause of this neglect is twofold: as far as it is “logic”, it is committed to the trans-historical ideology descending from the Eleatic discovery of abstract concepts; as far as it is “mathematical”, it suffers from the distorting effects of the ordinary “Euclidean” methodology. But if we adhere to the so-called “maverick tradition”, we can overcome this neglect and introduce in mathematical historiography the techniques which were elaborated by Foucault in his “Archaeology of Knowledge”. Thus we may recognize at the same time the importance of Principia Mathematica as the first supposed paradigm of the newly constituted discipline of mathematical logic and the reasons for its failure to overcome the requirement for epistemological foundation of mathematical knowledge. Finally, we establish the claim that the true establishment of mathematical logic is effected by Hilbert’s proof theory and Gödel’s completeness theorem. This means that the history of mathematical logic is much shorter and its relation to philosophy is more essential than is commonly believed. The text focuses on Fichte’s first systematic reflections in the manuscriptEigne Meditationen über Elementarphilosophie on the problem of circle as a part of his philosophical approach as well as a fundamental fact about the nature of reason itself. These early systematic attempts when compared to the stand of the Wissenschaftslehre lead to the observation of changes in Fichte’s method, which allow us to trace back important aspects of his philosophical development. My main thesis is that the difference between Fichte’s earlier and later positions consisted in his epistemological move from a coherentist to a foundationalist stance. It is precisely this change, which allows Fichte to overcome the vulnerability of Kant’s critical philosophy and Elementary philosophy to the sceptical critique and to offer a plausible solution to the system-philosophical problem of circle in human reason. The presented article digs into the affirmed and regular descriptions of the major research objects – Peirce, iconicity and the realistic interpretation as a methodological paradigm, hoping to reveal their first and immediate characteristics. Following the diagram of these characteristics the author tries to investigate all possible relations and legitimate interpretative directions and how they influence various traditions, clashes and trends in semiotics. As presenting and following all careful and conscientious scientific inquiries into the matter of Peirce in general and iconicity in particular and pointing out the common aspects among them the article aims to reflect on the ‘finally’ regulative and ‘really meaningful’ qualities of that theory. These qualities will always determine a specific context and will always bias future attentive philosophic searches into the problem… if ‘always’ is possible?! The article aims to explore the problem how a discursive regime – the Descartes’s one – functions performatively and invents modern subjectivity. This initial question leads to Foucault’s – Derrida’s indirect dispute and its stake – the status of madness as a social construction and the methodological strategy, which Descartes realises on the base of this madness construction. The article meets these two contradictory interpretations of Cartesian First Meditation and considers and uses the Mediation as empirical data. This approach aims: to solve the Foucault’s – Derrida’s dilemma and to explore the way of modern subjectivity construction in the frame of one performative discursive practice. The article ascertains that this discursive regime, through which the modern subjectivity was born and invented, and following essential disruption with all deviations functions as normalizing discursive ecstatic “machine”. Descartes’s discourse reveals the modern subject identity as mediated in the space of the interaction with itself and in this way defines a privileged viewpoint. From this point of view the social form of identity “I think therefore I am” starts to emanate symbolic efficiency as a determinate form of ideology. The article follows some of these types of identity that gradually start to crystallize after a deeper analysis of performativity of the Cartesian discourse. In that way the article proposes a possible way of its reading and a solution of Foucault’s – Derrida’s dilemma, raised from Descartes’s methodological exclusion of the madness but, on the other hand, this dilemma represents two very strong critical references about modernity and essential problematisation of otherness. 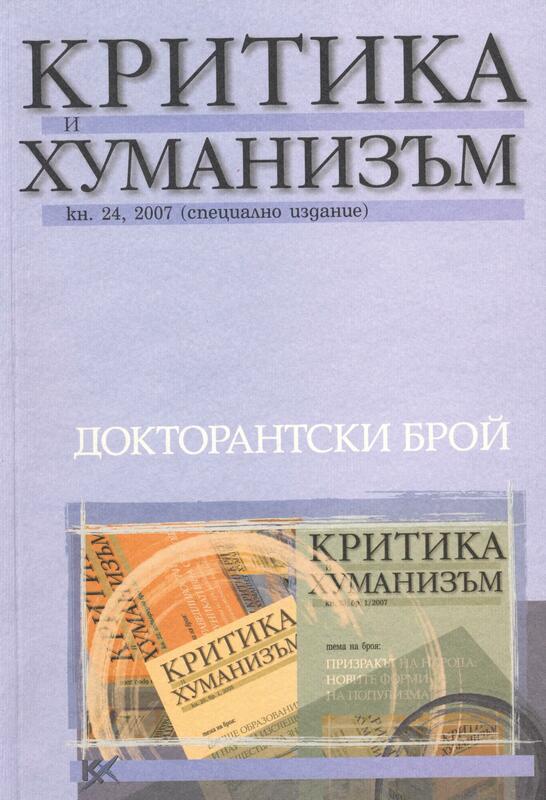 The paper reviews some etymologic and paradigmatic issues in defining the field of the ethnological knowledge in Bulgaria till the mid of the 20th century. There are competing definitions of “ethnology” and “ethnography” and the paper attempts at following the polysemy of their ways of use. Based upon the differences in the contents of the terms “ethnology” and “ethnography” as comprehended by different scientists, a conclusion could be drawn regarding the relativity in the object delimitations of ethnological knowledge. The relativity seems to be displayed by several approaches, fruitfully competing with each other. The following approaches are clearly outlined: anthropological, ethno-genetic, cultural-historical and philological.